The Rincon Fire District was formed in 1976, in response to the cancellation of a contract with the California Department of Forestry by the County Board of Supervisors, leaving the unincorporated areas of Escondido without fire protection. Through the efforts of a citizen’s committee, hundreds of homeowners petitioned Rincon Water to organize a fire district and to levy property taxes to fund necessary fire protection. An election was held and 86% of the electorate voted for the establishment of a fire department. The station was built in Felicita Park and staff consisted of many volunteer firefighters along with a small contingency of professional firefighters. By 1983, a second fire station was opened near Summit Drive and San Pasqual Valley Road. Staffing had increased to 12 professional and 15 volunteer firefighters protecting 3,500 homes within its sphere of influence. Prior to June of 1984, the Rincon Fire Protection District operated independently of the City of Escondido. 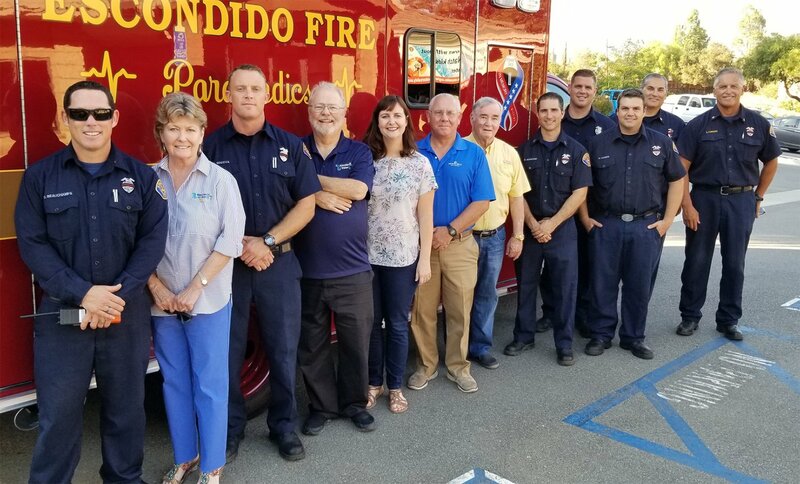 But, recognizing the mutual benefits of combined operations, both Rincon Water and the City of Escondido entered into a Fire Service Agreement in order to deliver consistent services across Escondido Valley in the most cost effective manner. Today, the City of Escondido continues to provide fire and paramedic services. while Rincon Water maintains administrative oversight of the fire district, which now serves more than 4,250 customers within the Rincon Fire Protections District. To see if you are in the Rincon Fire Protection District, click here.